Early Monday morning, New Orleans removed the first of four Confederate monuments that commemorate elements of slavery and white supremacy. The removal is meant to denounce racism and symbolize a new way forward for the Southern state, but the plans have been met with aggressive opposition, including violent threats. While the City Council voted 6-1 to remove the statues back in 2015, plans have been continuously delayed due to legal issues and insufficient funds. Now, a federal judge in Louisiana finally approved the plans, and the city issued a statement revealing that private funding had been obtained to remove the monuments, per CBS News. As for the monuments themselves, they really are egregious. Take the 1891 Liberty Monument, which is the one removed early this morning under police supervision. It was erected to honor a deadly fight involving the “Crescent City White League,” a group that was opposed to the city’s biracial police force and militia post-Civil War. In other words, they were a group that wanted to revive white supremacy, and killed black police officers. 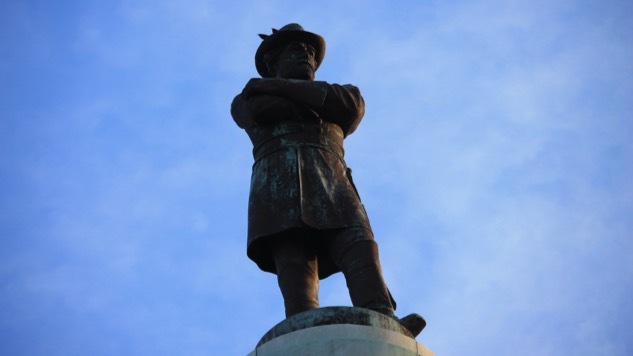 “If there was ever a statue that needed to be taken down, it’s that one,” Landrieu said. The other three monuments honor Confederate leaders Robert E. Lee, Jefferson Davis (the Confederate president) and P.G.T. Beauregard. Pro-monument people have now gathered for a candlelight vigil (yes, really) in front of the Davis statue, and Black Lives Matter supporters are staging counter-protests. Tensions are rising, and Landrieu is trying hard to keep things from getting too political. “This is about showing the whole world that we as a city and as a people are able to acknowledge, understand, reconcile—and most importantly — choose a better future,” he said. Removal of the other three statues will begin in the near future, and details are under wraps in order to protect the workers involved. The monuments will not be destroyed; instead, they’ll be relocated to a more “appropriate” location, such as a museum. May we recommend the Jim Crow Museum of Racist Memorabilia at Ferris State University? See below for a video of Landrieu’s morning press conference, and check out some Twitter posts of the removal, the pro-monument candlelight vigil and more.